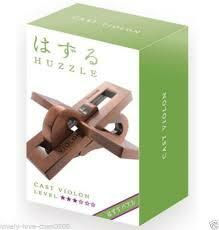 Originally designed by Joseph L. Little in 1965, the Violon puzzle depicts a violon and its strings. Nob Yoshigahara like the puzzle so much that he decided to make a version of it for Hanayama's Cast Series. The Cast Violon was released in October 2003 and the key word for it is "strings". VIOLON Hanayama Brainteaser is another fascinating puzzle in this series of tricky metal brainteasers. VIOLON consists of three odd-shaped metal pieces which interlock together. The three pieces must be totally separated and then reassembled to solve the puzzle. VIOLON is small, pocket-size brain teaser. Assembled the puzzle measures approximately 5.1cm x 6.4cm .